Is it a spot cooler or is it a Portable Air Conditioner? 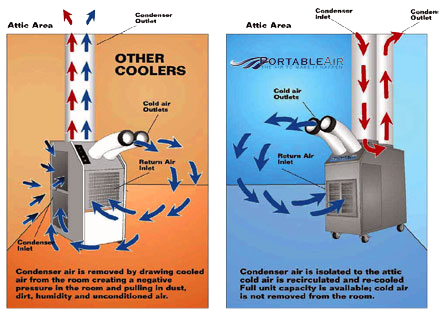 With a conventional spot cooler, condensed air is removed by drawing cooled air from the room, creating negative pressure and pulling in dust, dirt, humidity and unconditioned air. Portable Air Systems isolate condensed air to the attic. Cold air is recirculated and re-cooled. Full unit capacity is available. Cold air is not removed from the room.